Katie McGarry is one of my favorite contemporary fiction authors, and I love her Pushing the Limits series. I admit that I don't remember much about Lila from Pushing the Limits. It's been a while since I read that book and the minor characters are fuzzy for me. 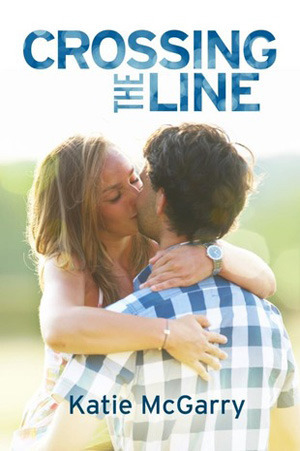 But, you don't have to remember much about Lila from book one to enjoy Crossing the Line. I love it when people fall in love over a long period of time, and corresponding via letters makes it even more special. I think it's such a romantic notion, to write letters back and forth. McGarry includes portions of the letters between Lila and Lincoln at the beginning of each chapter. I loved that because it showed the progression and slow build of their relationship. McGarry uses a first-person dual narrative. I love that narrating style in contemporary romance because it really lets the reader get to know each character. Crossing the Line had a more detailed plot than I would have expected. I loved the look into Lincoln's home life and the part about Lila's revenge on her tormentors was great. I love a strong female lead, and while Lila initially appears weak, she's really quite tough. The ending was very sweet and appropriate. I would love for Lila and Lincoln to have their own full-length novel at some point: I think there's definitely enough to their respective stories to warrant more time spent on them. If you haven't read Katie McGarry, I highly recommend her books!